Background and objectives Patiromer is a sodium-free, nonabsorbed, potassium-binding polymer that uses calcium as the counter-exchange ion and is approved for treatment of hyperkalemia. The 4-week TOURMALINE study in patients with hyperkalemia previously demonstrated that patiromer administered once daily reduces serum potassium similarly when given with or without food. We report a prespecified exploratory efficacy analysis as well as a post hoc efficacy and safety analysis of the TOURMALINE study on circulating markers of mineral metabolism. 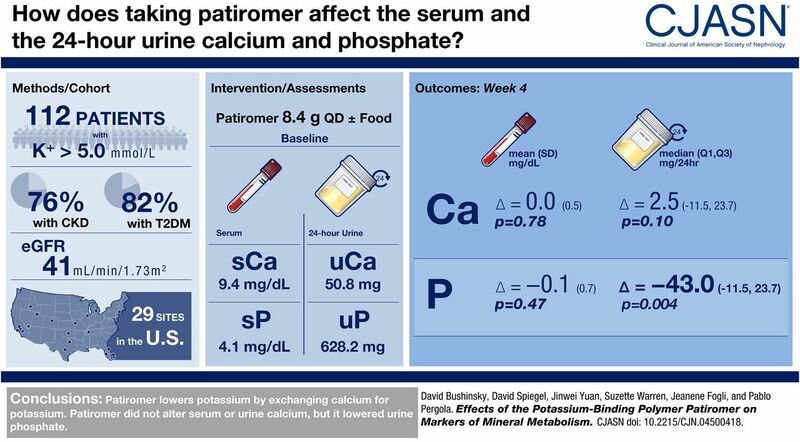 Design, setting, participants, & measurements Adults with hyperkalemia (potassium >5.0 mEq/L) were randomized to once-daily patiromer 8.4 g without/with food for 4 weeks, with doses adjusted to achieve and maintain serum potassium 3.8–5.0 mEq/L. Baseline and week 4 serum and 24-hour urine markers of mineral metabolism are reported for all patients combined (evaluable for efficacy, n=112; evaluable for safety, n=113). P values were calculated using a paired t test for change from baseline, unless otherwise specified. Results Mean (SD) baseline eGFR was 41±26 ml/min per 1.73 m2. Mean (SD) changes from baseline to week 4 were 0.0±0.5 mg/dl (P=0.78; n=100) for albumin-corrected serum calcium, −0.2±0.2 mg/dl (P<0.001; n=100) for serum magnesium, and −0.1±0.7 mg/dl (P=0.47; n=100) for serum phosphate. Median (quartile 1, quartile 3) changes in 24-hour creatinine-normalized urine calcium and phosphate from baseline to week 4 were 2.5 (−11.5, 23.7) mg/24 h (P=0.10; n=69) and −43.0 (−162.6, 35.7) mg/24 h (P=0.004; n=95), respectively. Median (quartile 1, quartile 3) changes in intact parathyroid hormone and 1,25-dihydroxyvitamin D from baseline to week 4 were −13 (−31, 4) pg/ml (P<0.001; n=97) and −2 (−9, 3) pg/ml (P=0.05; n=96), respectively. There were no changes in fibroblast growth factor-23 or 25-hydroxyvitamin D. In patients (n=16) with baseline serum phosphate >4.8 mg/dL, the mean (SD) changes in serum and 24-hour creatinine-normalized urine phosphate from baseline to Week 4 were −0.6±0.8 mg/dl (n=13) and −149.1±162.6 mg/24hr (n=9), respectively. Conclusions Patiromer lowered urine phosphate in all patients, and lowered both serum and urine phosphate in a small subset of patients with hyperphosphatemia. Intact parathyroid hormone and 1,25-dihydroxyvitamin D decreased, with no change in serum calcium.